We are angry. In the course of the Presidency of the G20 countries, Germany has put Africa on the agenda. And Germany invites to the „G20 Africa Partnership Conference“ which takes place on June 12 and 13 in the Schöneberger Gasometer in Berlin, ahead of the G20 meeting in July in Hamburg. What kind of partnership is this? Already, during the time of slavery, many people drowned in the sea. Because they were thrown overboard. Or because they jumped themselves to escape the hell of the slave ship and the plantation. Today they are drowning during the attempt to reach Europe in crowded boats. Looking for a safe, better or simply different life. We are angry. The European Union is trying to close its borders. And that means it moves its external borders on to the African continent. This is caused by filthy deals with corrupt and criminal African regimes, such as Sudan or Eritrea, which are overloaded with so-called development aid to close the escape routes. “Mobility partnerships” they call it or “better migration management”. The effect is that the mobility on the African continent is increasingly restricted. Building borders in Africa – Europe knows how to do it. During the so-called Congo Conference, which took place in Berlin in 1884-85, the colonial powers divided Africa among themselves. The colonial heritage characterizes the present. Even if there is talk of partnership today. Words are deceiving. And sometimes they are traitorous. The Marshall Plan for Africa, which the German Development Minister has devised, is about so-called reform champions. African states are allowed to take part, if they behave just like the masters want. This is paternalistic, the Marshall Plan is a master plan. In addition to the Minister, the Master is the private economy of the G20 countries, which is to be encouraged to invest. After all, there is something to be gained: the African population is expected to double by the middle of the century – a considerable number of cheap producers and new consumers. This arouses interest among the advocates of the neoliberal market. Today we meet again in Berlin. And this time, selected African governments can also sit at the table. What will they talk about? What is the partnership about? Who could benefit? Perhaps the biometric industry, a growth sector that is increasingly producing for African countries so that they can better control their borders. Veridos, a company based in Berlin, for example, in which the Bundesdruckerei is also involved, is equipping the border installations of Morocco, in the form of electronic devices, which are intended to detect fake passports. The German company for international cooperation, on the other hand, provides equipment for border guards, among others in Sudan and Eritrea, including cars, cameras, scanners and servers. The list could be continued. The construction of border installations in any case is a worthwhile business. It promises not only profit but also a calm life in the European feel-good zone, without mass immigration and annoying pictures of flooded corpses on southern European beaches in the evening messages. We are angry. And we do not believe in your Marshall and Master plans. Stop the cynical talk about partnership. If you want to fight the causes of immigration, just ABOLISH YOURSELF. Because You – your arms and your corporations – are the organizers of misery, which you manage and from which you profit. But the deads in the Mediterranean and the other external borders are your pitfall. And if you want to limit our mobility, let’s say that freedom of movement is a fundamental right. With what explanation do you want to keep it from us? Your national logic has been spent. It no longer answers the questions of our time. Human is human and that´s it. basta. 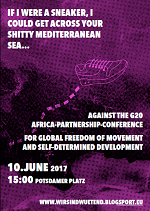 Stop the rearmament of the inner-African borders! Stop the gun delivery to Africa! Stop the ruling development policy that aggravates the misery in African countries! Solidarity against exploitation and oppression!